Are these frying your head? A scientific controversy that affects just about all of us has come to the fore. The question: how safe are cell phones? “Mobile Phone Study Finds No Solid Link to Brain Tumors”- The Guardian, UK. 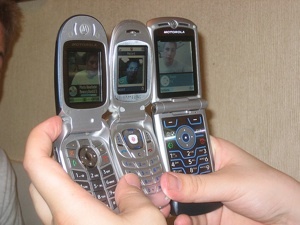 “Heavy Use of Cell Phones may increase Tumor Risk.” Globe and Mail, Canada. “Mobile Phones are Safe” Die Welt, Germany. So if you’re confused, you’re not alone. Consider these contradictory findings: High cell phone usage was linked to a doubling of the risk of deadly brain cancers called gliomas. Read more.. or to listen to MP3 of this interview. Editor’s Note: I childhood friend of mine is now in hospice care, with a brain tumor. For many years, he has only had a cell phone, and no land line. The doctors said off the record, they were sure it was from his cell phone use, as were many others they have seen doing brain surgery. Does mind make the body age? 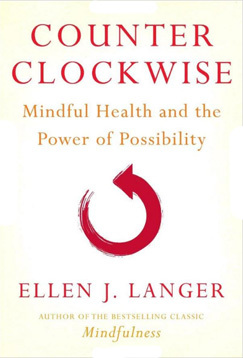 Robin Young, on her radio show, Here and Now, recently interviewed Harvard psychologist Ellen Langer and author of Counter Clockwise, Mindful Health and the Power of Possibilities about about what she calls mindfulness and mindlessness — and about the power of psychology on physical health. Drawing on her own body of colorful experiments—including the first detailed discussion of her landmark 1979 “counterclockwise” study in which elderly men lived for a week as though it was 1959 and seemed to grow younger—and important works by other researchers, Langer discussed how studies prove that the magic lies in being aware of the ways we mindlessly react to cultural cues. Her book shows how we can actively challenge these ingrained behaviors by making subtle changes in our everyday lives. 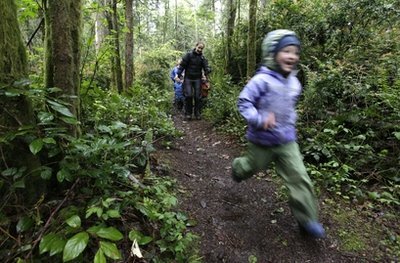 The author describes ways to reorient our attitudes and language in order to achieve better health; she shows us the ways in which our belief in physical limits constrains us; and she demonstrates how our desire for certainty in medical diagnosis and treatment often prevents us from fully exploiting the power of uncertainty. Jennifer Aniston is slated to play Harvard psychologist Langer, whose work helped trigger the positive psychology movement. Our Water Supply: Genes affected? 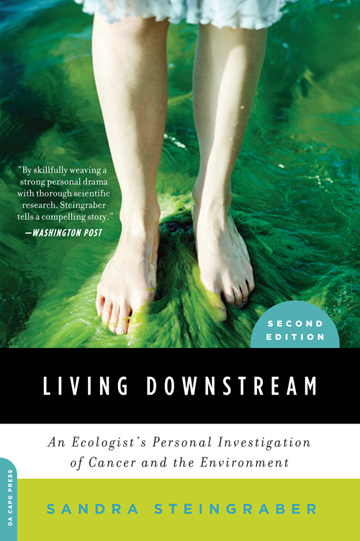 New Book: Living DownStream – Shows evidence showing links between environmental toxins and cancer rates. 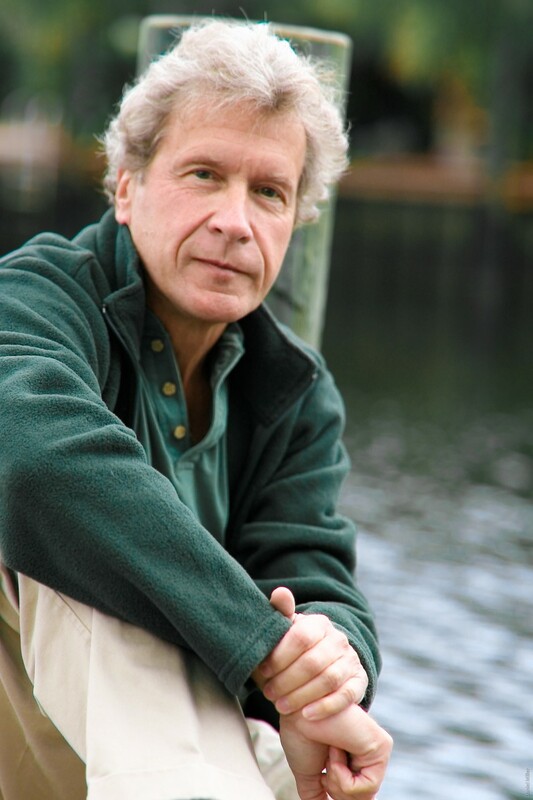 Steve Curwood of LOE, interviews author Sandra Steingraber. For the audio MP3 click here. CURWOOD: Recently the journal Pediatrics reported a link between exposure to pesticides and the condition ADHD, attention deficit/hyperactivity disorder. It seems that almost every week we learn some unsettling bit of news about the effects of chemicals in our food, or water, or air, or the products we use. Environmental chemicals have long been a concern for author and biologist Sandra Steingraber—particularly those linked to cancer. In a new film based on her groundbreaking book of more than a decade ago, Ms. Steingraber explains why her own cancer diagnosis as a young woman left lingering questions about the disease. CLIP: I’m one of those people who really does come from a family with a lot of cancer in it. I wasn’t the first in my family to be diagnosed. My aunt went on to die of the same kind of bladder cancer that I had. I have uncles with prostate cancer, colon cancer, but the punch line of my story is that I’m adopted. CURWOOD: Sandra Steingraber’s book, “Living Downstream”, laid out evidence showing links between environmental toxins and cancer rates in her hometown. Now a new edition of the book and the film of the same name expands the evidence of the relationship between our health and our environment. Sandra Steingraber, welcome to Living on Earth. BP’s CEO – Does he grasp severity of accident? NORRIS: Mr. Hayward, this is the deepest well blowout on record. And the people are most knowledgeable in dealing with deep water wells are at the outer edge of their expertise, even when things are going well. The Coast Guard and oil industry analysts say that drilling here is almost like visiting outer space. It’s like a great unknown. So why are you drilling there if there’s so much that is not known about this territory? Dr. HAYWARD: Well, we’re drilling because it’s a very important source of energy for the United States and the world. That is the reality. Almost 30 percent of the United States oil production today comes from the deep waters. That is where there is the opportunity to provide domestic energy security. That is where there is an opportunity to provide energy security for the world. And, of course, oil isnt all of the solution but it’s a part of the solution. NORRIS: That opportunity obviously comes, though, with great peril. Is deepwater drilling riskier than BP believed? Dr. HAYWARD: I think you have to go back to, you know, the track record of the industry and BP’s over the last 20 years. The industry has drilled over 5,000 wells. BP has drilled around 1,500 of those 5,000 wells, and this is the first time that we’ve had a major incident. And I think it is legitimate to draw analogies with, for example, the space program. The space program was not canceled because of the issues around Apollo 13. It’s also legitimate to draw comparisons with the airline industry. When the Air France plane fell out of the sky coming out of Brazil, we didnt ground the airline industry. So we need to learn the lessons here. They will be learned and they will shape, I’m certain, the industry as it moves forward. Drawing analogies between this accident and the Apollo 13 mission makes no sense at all and he uses it to distract from the severity of this incident. There were, first off, no deaths associated with the Apollo 13 mission, and second, Dr. Hayward is completely disregarding the damage the leaking oil and gas is causing to the environment and the coastline communities. The same is true of the Air France flight. Yes, 228 people died in the accident, but Dr Hayward is saying we should not stop deep oil drilling because we did not ground the airline industry after the plane went down. This analogy illustrates how disconnected Dr. Hayward is from the severity of the oil spill. He is only seeing the deaths, and the money lost. He is not considering the vast unaccountable ecological damage the oil is causing. Moreover, the Apollo 13 mission and Flight AF447 did not lead to an economic disaster causing hundreds of people to lose their livelihood as is happening on the Gulf coast right now. Flight AF447 did not continue to reek havoc on the surrounding environments for months after the crash. This sort of thinking is how we got into the environmental situation we are in now. People in power in these large corporations are not willing to say, “You know, this technology is not necessary, it is just too harmful.” Their focus is always on shareholder profits, never on wider ecological impacts. 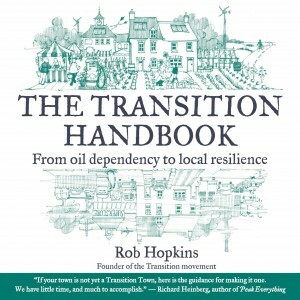 Our disconnection from the natural systems that keep our communities and economies alive is leading us to our own destruction. Where would we be if a hundred years ago people noticed how dirty and destructive fossil fuels were and decided to try alternatives instead? You’ll be seeing images posted not only on Facebook, but on our Flickr site as well. We’ll have images from the Alps, Peru, New Zealand, the USA, and from subjects covered on our blog at WordPress. Our images will cover not only programs and events but world issues such as sustainability and holistic living.